Williamsburg has been hungry for Junior Golf Development programs that focus on developing individual skills, fostering talent to improve future high school teams and prepare young golfers for the collegiate level and beyond. Ed Teer Golf Academy now offers the area’s only year-long, multi-day program called Journey to Excellence. 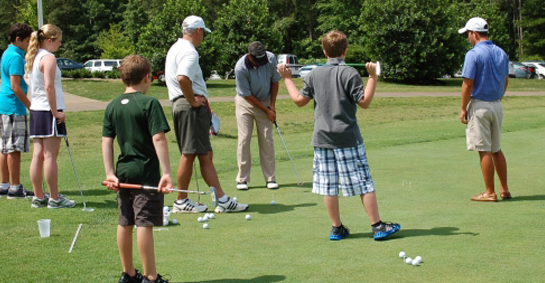 For the summer time we offer: US Kids Junior Camp and Ed Teer Golf Academy Junior Camps. ETGA Junior Camps are for ages 10-14. I’ll discuss 9 year olds on an individual basis. Clubs are great to have but not necessary. Please don’t purchase before consulting ETGA. Not all junior clubs are created equal. The Ed Teer Golf Academy will be hosting three US Kids Junior Camps for juniors ages 5-11 and more info will be posted soon on the website for both programs. The Journey to Excellence program for juniors aged 5-12 is called Rising Stars; juniors aged 11-14 can participate in New Competitive Golfer and more experienced golfers aged 13 and up can gear up for Striving for Excellence. The next session is slated to begin in early June and will be lasting through August on Thursdays and Saturdays(Including Tuesdays for Competitive Golfers and Striving for Excellence groups) but can be joined at any time to accommodate your family’s schedule. To learn more about these programs visit my Junior Coaching page online along with its sub-pages. Fun, Games and Fitness is the underlying goal of the Rising Starts program. The Basic Forms and Essential Skills to enjoy the game of golf for a lifetime are presented in a fun game like atmosphere. Along the way they will be rewarded for achieving a basic level of proficiency that comes with dedication and practice. Find out more at Edteergolf.com now! We have a few different group options coming up for adults in the month of June including the Four Week Essential Skills Clinic, Adult Performance Group and Supervised Practice Session. Visit our home page today for a short description.